Shas head Aryeh Deri promises no coalition crisis over Shabbat construction, causing disgruntled UTJ MKs to weigh their options. 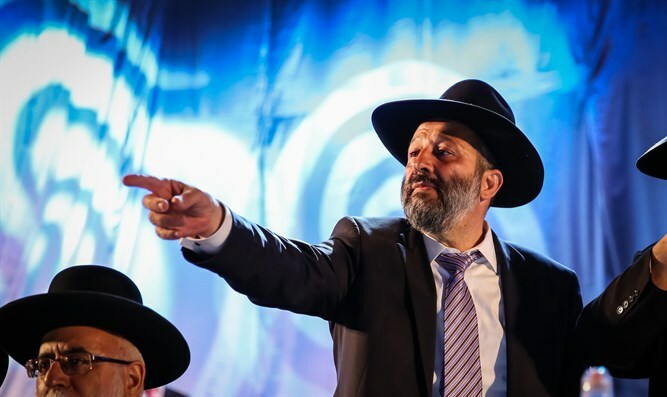 Two weeks after the Shabbat crisis broke out around the issue of railway construction on the day of rest, it now appears that it is even dividing the haredi faction. After the Supreme Court ruled that the Prime Minister has no authority over the matter and Transportation Minister Yisrael Katz made clear that necessary work will proceed on Shabbat as they have in the past, Minister of the Interior Aryeh Deri has taken a conciliatory tone, clarifying that he will not initiate a coalition crisis over the Shabbat issue. "We, the heads of the haredi factions, have no interest in starting crises. We also understand that we don't live in a Halakhic state, that we haven't yet arrived in the days of the Messiah, and that we have not yet reached the ideal situation where all Jews appreciate the essence of Shabbat," Deri said yesterday in an interview with the haredi Kol Hai radio. Deri elaborated further: "In Bnei Brak and Har Nof [a religious neighborhood in Jerusalem] people don't violate the Shabbat, but the secular population in Israel needs to understand, with all due respect, that we are fighting for Shabbat and the Jewish character of the state of Israel on their behalf. All that being said, at the end of the day, it is they who will need to decide what kind of Shabbat they want. We won't coerce anyone into doing anything. "We also need to remember that we still need to fight for our education and the rights of the haredi public. We live in a secular country. A Jewish country, but nevertheless a secular one. It's come to the point that when you speak to them they don't understand what the essence of Shabbat is. MKs from the Ashkenazic haredi faction in the coalition, United Torah Judaism (UTJ), weren't particularly pleased with Deri's moderate attitude. In response to Minister Katz's statements today to the effect that construction on Shabbat will continue, the UTJ MKs said that they are considering several options to try to change that state of affairs. Sources from within UTJ said that the party is considering assembling the council of Torah sages to decide the issue. In addition, a move is being considered to initiate legislation to make the status quo legally explicit and preserve the public observance of Shabbat. Such legislation will have to wait until the Knesset winter session opens.